At first glance, this seems reasonable. No one has a problem with legal content or nonharmful devices, right? But one must wonder why the words “legal” and “nonharmful” were included? Reread the phrase and leave out those words. Does it really change the meaning? Would Net Neutrality proponents care if those words were left out? Do Net Neutrality proponents actually prefer that those words were left out? Perhaps you are now starting to see my concern. What about “illegal” content or “harmful” devices? At first you may think, “who cares”? If it is illegal or harmful then why does it matter? Well it might matter if your content is suddenly deemed “illegal” or your device is classified as “harmful”. Is it inconceivable to think that powerful lobbies could influence the government to deem content or devices they don’t like as “illegal” or “harmful”? (as an aside, what the heck is a “harmful” device?) They can’t do that now, because the federal government and FCC do not have the authority to regulate the Internet. But soon they might claim this authority. Then what? Astute readers will probably point out that the FCC proposal doesn’t obligate Internet Service Providers to block illegal content or harmful devices. True enough. But if the FCC claims they have the power to control what Internet providers can do, how far of a stretch is it to surmise that the FCC will one day claim they have the power to censor the Internet? 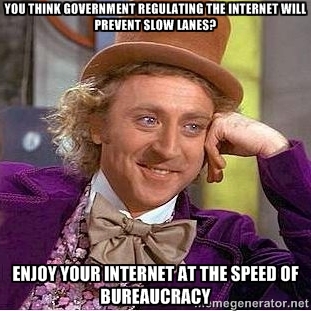 Of course, it will be ostensibly for “the public good”, as they claim their rules for Net Neutrality are as well. Understand that the FCC already censors radio and TV. The great thing about the Internet is that it IS free and open (well, at least until the FCC gets hold of it). The stark contrast between the uncensored Internet and FCC-censored radio and TV is one of the reasons the Internet has transformed society. Keep this in mind: the freedom of the Internet – our freedom – is about to be decided by 5 unelected bureaucrats. People who have incentive to give themselves more control. Because control means power and what government entity doesn’t love power? Net Neutrality proponents fear being controlled yet they are about to hand over the Internet on a silver platter to the most powerful and controlling entity on Earth. Can someone explain to me how that makes any sense?